Foundation requirements for a coil-fed laser blanking system are minimal; the equipment is fast to install and relatively portable, compared to the heavy-duty presses needed for blanking body panels in high-strength steels. Today’s automotive companies are faced with managing a multitude of challenges, including aggressive fuel economy standards, which is accelerating the use of advanced lightweight materials; and global competition, which is driving modularity strategies and mass customization. Pressure to reduce cost and launch time continues to increase. New strategies and products to meet these trends depend on new manufacturing processes and technologies that can help automakers innovate at competitive costs – including laser cutting. Lasers take a direct shot at some of the most costly aspects of hard-tooled blanking: eliminating expensive tools that can take months to manufacture; tryout and modification time; and the higher tonnages and shorter die life that result from adopting ever-stronger steels. It can require six months to a year to develop the original forming die sets. Add the tryout and modification time typically required, as well as 14-16 weeks to produce the final blanking die after tryout is completed, and the process becomes both lengthy and expensive. Meanwhile, advances in lasers over the past decade have produced dramatically faster laser cutting speeds, making it a potentially attractive choice for both high volume and low volume applications. And, most recently, new solutions that can laser blank direct from coil stock make laser cutting a realistic, cost-effective alternative to mechanical cutting of developed blanks from a raw material in coil form. Total costs-per-part have closed in on each other. Let the competition begin. Coil-fed, with two cutting heads, LaserCoil’s newest system is aimed at high-volume laser cutting of automotive panel blanks. Fuel efficiency mandates have led to the increased use of lighter steels, such as Advanced High Strength Steels (AHSS) with tensile strengths of 1,000+ MPa (145,000 psi). Research shows that AHSS will comprise up to 40% of vehicle content on body and closures by 2025. Comprised of complex steel chemistries and thermo-mechanical properties that produce higher yield and tensile strengths, AHSS allows automakers to maintain structural integrity while using lighter gauge steel material to reduce the weight. However, it’s harder to cut with hard tools, and it’s vulnerable to microcracks at the cut edge. AHSS has helped automobile “lightweighting” while it has created new headaches for manufacturing. Stamping AHSS typically requires higher press tonnage, which is hard on tooling. It can even break dies and presses. It’s conceivable that a high strength steel application may require a blanking operation to be moved to a larger capacity press to achieve the same cut that was achieved on mild steel. This results in higher maintenance costs for blanking tools, with cutting edges dulling at a faster rate. Secondly, quality becomes an issue when the number of micro-fractures along the cut edges of the blank increase. As the hardness of the advanced strength steel increases, so does the propensity for micro-fractures, which can develop into splits during the forming process. Laser blanking eliminates both the potential need for a larger press to cut higher strength materials as well as the edge fracturing problems that often occur. Tensile and yield strength has little to no impact on laser cutting speed, so laser blanking production costs don’t increase with increased material toughness, and material thickness doesn’t increase capital costs. Plus, the cost to maintain laser consumables is much less than that for die and tooling upkeep, which goes up significantly in these tougher materials. New dual-phase steels have tooling maintenance costs that are about four times that of costs for mild steel material. Additionally, laser cutting reduces work-hardening issues and microcracks to deliver a clean edge.Micro-fracturing has actually been non-existent with the LaserCoil process – there are no formability issues in the edge and the dross accumulated is generally less than half the burr size of that on a mechanically cut blank (on lighter gauge material), resulting in a much higher quality edge. Hard-tooled blanking often requires cut clearances and approximated shapes that waste material. Laser cutting has a real advantage in material usage. Globalization of the automotive industry has put a focus on mass customization, resulting in the development of more “niche“ type vehicles that meet individual tastes. The drawback is that the additional models have lower volumes, changing the business model. The investment required to manufacture a part can no longer be spread out over a large number of parts, but needs to be divided over the lower volume. As production volumes fluctuate and niche models enter the market, laser cutting offers flexibility and speed. By eliminating dedicated tooling, material can be ordered and the cutting path programmed in less than a day. 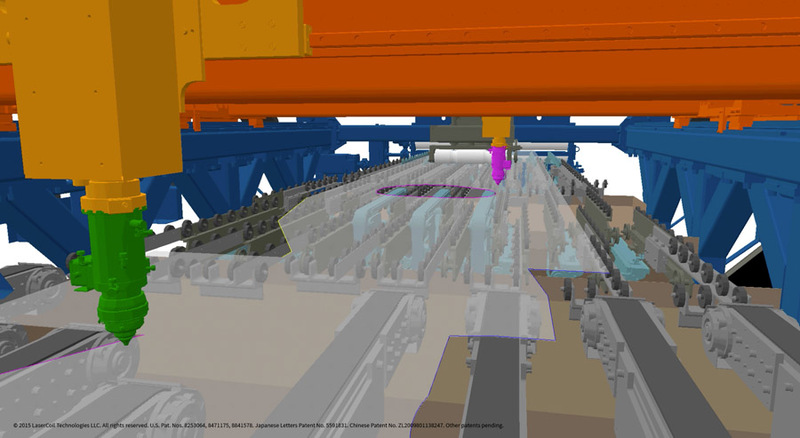 Costly changes that would take days to implement via hard tooling can be made for virtually no cost and in five minutes via simple 2-D CAD software. Users can simply input a 2-D CAD file, and from this the cutting path is downloaded directly to the laser cutting system’s line supervisor. Cutting speeds are determined automatically by the system, allowing the fastest production rates based on material thickness and cutting path details. The blanks are nested in a strip in such a fashion that the amount of scrap produced by the blanking process is minimized. Today’s laser cutting also provides cost savings through more efficient usage of the raw material. Whereas typical part-nesting routines have many rules, based upon the type of punching or shearing used to cut inside the blanking die, laser cutting simplifies the process and expands the nesting opportunities to maximize coil utilization and minimize scrap. Laser cutting favors the same contour features as the forming process – large radius curvilinear features — rather than straight segments and angular features. This provides flexibility in part nesting and improves formability by enabling more curvilinear features that require less binder and formability beads. Typically, the net result is 10% – 20% improvement in material yield. To truly understand the benefits that can be delivered by a coil-fed laser cutting system requires an analysis of the traditional approach to blanking – systems which consist of a coil processing line, a mechanical press, and blank stacking equipment. This “traditional” blanking line configuration requires a massive pit for the press, as well as an increased ceiling elevation at the facility that allows for installation and maintenance of the press. Additionally, bolsters are required for quick die changes, doubling the press bed area required for operational floor space. Additional floor space is also required for the storage of the different die sets required to stamp the different parts running on the press line. With a laser blanking system, there is no need for a high bay or a press pit in the foundation. The material is processed at a constant velocity, also eliminating the need for a looping pit in the foundation and adding to the portability of the line. The complete line can be moved to a new location, helping reduce transportation costs associated with shipping finished product long distances,or the line can be re-located closer to a raw material source as the business plan requires. And, in LaserCoil’s case, their systems can be integrated to work with traditional coil feeding equipment or retrofit to existing press feeding lines. This allows users to leverage existing capital equipment investment and lower the cost of laser blanking system implementation while gaining flexibility, speed and a high level of quality. Although laser blanking from coil may not fit every high production situation, it should be considered as a potential alternative processing solution. If you’re stamping parts at 50 to 60 strokes per minute (SPM), laser blanking may not be the best choice in terms of speed. However, it can still provide die cost savings, reduction in production changeover as there is no die change, reduced time to market, flexibility and improved edge quality. The advantages can outweigh raw blanking speed when you calculate all of the factors that contribute to the cost per part.